LOS ANGELES- Today, Assyrian Genocide and Research Center, Seyfo Center, joins Assyrians and advocates of human and social rights all over the world in commemorating the tragic events that took place during the Assyrian Genocide in 1915. 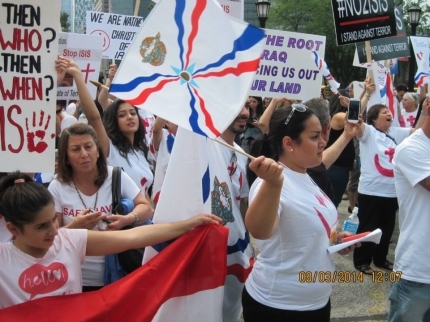 Assyrians recognize the genocide every year on August 7th as a day to remember those who were killed and honor those who sacrificed their lives for others. 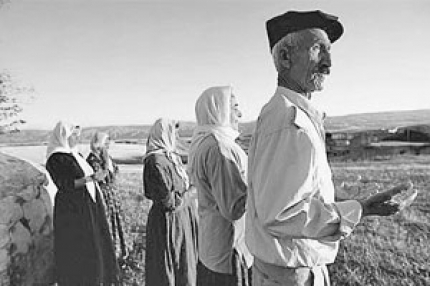 In all the demonstrations, the people wore a white shirt emblazoned with a red Arabic letter "noon", which stands for the Arabic word for Christian (nasrani). Two weeks ago ISIS marked all Christian homes and institutions in Mosul with this letter to identify them as Christian, and wrote "property of the Islamic State" on most of them (AINA 2014-07-19). In Sydney over 6000 thousand people attended the demonstration.